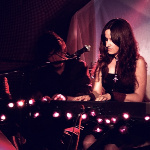 Lantana started in 2006 when she signed and released an EP with EMI/Virgin right after composing a song for the film "AzulOscuroCasiNegro" ("DarkBlueAlmostBlack"). This song was later nominated for a Goya for "Best Original Song." Lantana released her first LP in 2007, "Desorden y Amor" (also with EMI / Virgin), produced by the renowned spanish producer and artist Suso Saiz (Ivan Ferreiro, Piratas, etc). This was a precious album that did not go unnoticed. Lantana was nominated in 2008 for "Best New Artist" in The Spanish Music Awards with her single "Siempre". MTV Spain described her as "Pouring emotional pop". In 2009, Lantana went back to the film industry to work as an actress. She later performed with Tam Tam Go in the concert for their twentieth anniversary in the roman amphitheater of Merida. In May of that year, she decided to go to London to record her third album, "Ex-Corazon", produced by Dimitri Tikovoi (Placebo, The Horrors ...). This last work is probably the most important in the career of this young artist and songwriter. She worked with new sounds, taking her songs to the most direct pop, without losing sensitivity nor originality and yet gaining force. Electronic sounds mix themselves with pianos and electric guitars forming a beautiful, eclectic, elegant and exciting album. This promising album was just published in 2010 by her new record label, Rubie Music. The first single, "Ex-Corazon", was released before the album and the same video is already being played in several spanish music TV channels. Lantana and "Sol Musica TV" did a remix contest together where DJs and producers from all over the world participated. The winners will be released in a vinyl and CD together with the remix of Nacho Canut (Fangoria). 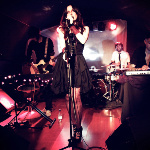 Lantana's influences range from Amy McDonald, Fangoria, Depeche Mode, Tori Amos, PJ Harvey to Mina.